Yesterday I took my sister-in-law pillion on the bike, the first time she has ever been on a motorcycle. 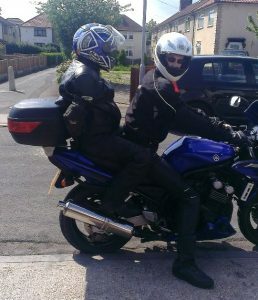 Kitted out in a mixture of my spare leathers and my wife’s gear, I gave her a lift back home to Islington. Lovely sunny weather, just cleaned, polished the bike and a great day to ride out through the quiet-ish city streets. She was a little scared and apprehensive at first, but soon got the hang of it and thoroughly enjoyed the ride. Was a great ride, except for when I mashed the gears trying to pull away in 2nd or 3rd, stalling lots and struggling to find first. Doh!